Hemoglobin is made up of four strands of amino acids. Two strands have 141 amino acids each, and the other two have 146. The total number of amino acid molecules in hemoglobin is thusly 574. In his book, The Blind Watchmaker, Richard Dawkins, the world’s leading evo-illusionist, discusses the odds of hemoglobin forming randomly in some location somewhere. He doesn’t give the location of the formation, so it must be assumed the assembly takes place inside of some cell somewhere. In his discussion, he casually dismisses three of the strands by saying, “Let’s just think about one of these four chains”. Actually, when I read his book, like probably all readers, because it comes before his discussion, I didn’t know what he was getting at. I completely dismissed and missed the huge meaning of this sentence. Here is evo-illusion at it’s best. His ability to sneak in “Let’s just think about one of these four chains.” and dismiss the other three strands without raising great scientific complaint is astounding, and really top-notch evo-illusion. But it actually matters not. Let’s let Richard do his evo-illusion, and work with his numbers. The odds of only one strand forming will do the job for me just fine Richard. Using Richard’s own evo-illusion will kill the notion of the random assembly of hemoglobin. Dawkins calculates that the odds of one single hemoglobin molecule strand forming randomly when the proper building blocks are intelligently and mechanically isolated and in close proximity is 1 in 10190. (In case you forgot your math, 10190 is a one with 190 zeroes after it. One trillion has 12 zeroes.) Each location on his one strand has a 1:20 chance of locking in the correct amino acid, as there are twenty amino acids used by vertebrates. One would figure the odds of 146 mounting correctly by multiplying 20x20x20…… 146 times. The result is 1 in 10190. There are approximately 1080 atoms in the universe, to give you an idea of the chances of any protein forming from randomness. 1080 is only 1/10110 of 10190! When you are working with numbers such as these, discussions are useless. You are essentially working with infinities. The odds 1:10190 are only valid if there truly is an affinity for proteins to form, which there isn’t, and if the ingredients are placed in close proximity. Selection of ingredients and complete isolation of those ingredients requires intelligence. Without selection and isolation, the odds would not be remotely close to 1 in 10190. They would be much much worse. Isaac Asimov was so stunned by these odds, 1 in 10190 , he gave them the name The Hemoglobin Number. There are tens of thousands of proteins that make up a single living cell. The random formation of each protein chain would have similarly absurd odds. For the fun of it, and for Richard, I have calculated the odds of all four strands randomly forming to make up one single molecule of hemoglobin. The answer and the True Hemoglobin Number is 1:6.2×10746. Since there are 1080 atoms in the entire universe, I think you see where we are. 1.6×10746 is more atoms than there would be in all of 10666 universes. Richard got away with a fantastic evo-illusion here. Actually, proteins are made of chains, like snap-together pearls. The notion that any amino acid molecule would have any chance of finding its way into position on a partially assembled “pearl necklace” of amino acid molecules is absurd. But I will discuss it like Richard does as if it could happen. To build on his illusion, and to solve this seemingly unsolvable problem for evolution, Dawkins asks that his readers do a mind experiment which hopefully will make the horrendous odds of the hemoglobin number seem like it can be overcome. He asks them to visualize monkeys typing randomly on typewriters until one comes up with this sentence: METHINKS IT IS LIKE A WEASEL. There are 28 letters and spaces in this phrase. There are 26 letters in the alphabet, and with a space the total digits is 27. So each of the 28 locations has a 1 in 27 chance of having the correct letter or space attached to it. To calculate the odds of METHINKS IT IS LIKE A WEASEL being randomly typed by monkeys banging on typewriters, one would have to multiply 1/27 twenty-eight times. Dawkins gives the odds at about 1 in 1040 or a ten with forty zeroes after it. You see, you’re still left with almost 10190 . But that’s typical evolution; the evo-illusionists fooling the evolutionauts and whoever else will listen. If Dawkins used a phrase with 95 or 96 letters and spaces, such as the last phrase in the Gettysburg Address,“…THAT THE GOVERNMENT OF THE PEOPLE, BY THE PEOPLE, AND FOR THE PEOPLE, SHALL NOT PERISH FROM THE EARTH”, he could have had a more appropriate comparison. The odds of monkeys typing Lincoln’s phrase are about 1 in 10190, the same as the hemoglobin number. To improve the odds for the monkeys randomly typing Dawkins’ chosen phrase, Dawkins uses what he calls cumulative selection. Dawkins loaded his WEASEL phrase in his computer as a target. Each time a letter landed in the correct location needed to form the WEASEL phrase, it is “cumulatively selected”. It remains in place, instead of completely reloading the entire sentence each time the “monkeys” in his algorithm typed a mostly incorrect 27 letters and spaces. In Dawkins’ world, the monkeys typing correlate with hemoglobin trying to invent itself. With Dawkins’ slick cumulative selection illusion, each jumbled molecule with some correct amino acid placements was supposedly saved in the organism that was in the process of evolving hemoglobin. That organism then has offspring, which allowed for another round of cumulative selection. Each new generation did the same, saving the good placements and only allowing the reloading of the incorrect ones. Generation by generation a full hemoglobin molecule was eventually and easily formed. By keeping the correct letters accidentally placed in their correct position, then adding to those, Dawkins says the odds of a monkey typing METHINKS IT IS LIKE A WEASEL and hemoglobin evolving in organisms get much more favorable. Here is Dawkins problem. Dawkins should call his process cumulative cheating. Cumulative selection is cheating, but that matters not. This is evo-illusion. Illusionists cheat, and that is how they fool people into believing they are seeing what they are not actually seeing. If Dawkins is a golfer, I wonder if he uses cumulative selection on the golf course. It would work even better with bowling! Under cumulative cheating, Dawkins gets as many balls as he needs to bowl a strike! I wonder if he cumulatively selects his scores. Hey, maybe he’s on to something! Actually, METHINKS DAWKINS TRIED TO WEASEL OUT ON THIS ONE. When Dawkins ran his algorithm on a computer, with the target WEASEL phrase typed in as his target, he came up with METHINKS IT IS LIKE A WEASEL in 64 generations and about a half an hour. On another try it was only 40 generations! Dawkins didn’t emphasize and clearly explain in his book that his programming METHINKS IT IS LIKE A WEASEL into his algorithm as a target for the cumulatively selected letters to aim for has absolutely nothing to do with the odds of hemoglobin forming from Dumb Luck. He explained it as if his algorithm was a good rationalization for the hemoglobin number when he had to consciously know it wasn’t. Dumb Luck has no targets. What Dawkins actually did is prove Ingenious Invention and Design (IID)was needed for there to be any reasonable chance to form hemoglobin and his own intelligence and planning were needed to get his computer to randomly come up with METHINKS IT IS LIKE A WEASEL. Targets cannot be made without intelligence. Dawkins algorithm made the odds of getting METHINKS IT IS LIKE A WEASEL 100%. The only question was how many generations or tries it would take. Of course, the answer lies somewhere around 40 and 64 tries, a far cry from 10^190. I wonder why Dawkins didn’t just fill a 55-gallon drum with all twenty amino acids and see if any proteins form at all. Wouldn’t that have been a better test than his “monkeys typing” algorithm? Actually, I know the reason: he wouldn’t get a single protein molecule of any kind. If his computer program corresponded to a hemoglobin molecule forming in a living organism, the organism in which hemoglobin was evolving would have had a fully formed hemoglobin molecule as a target model for Dawkins’ cumulative selections to aim for. That just simply isn’t possible, unless some intelligent inventor seeded hemoglobin or the plans for hemoglobin into the organism in some fashion, then instructed the cell to copy the implanted hemoglobin molecule. The cell would have had to “know” that hemoglobin was its target. Another big question here is why Dawkins didn’t write his algorithm using the actual DNA code for hemoglobin in the first place. Each amino acid could have been assigned its own actual codon. Each codon for each amino acid is made up of three letters, not just one. So why the METHINKS IT IS LIKE A WEASEL phrase? The answer is rather obvious. The WEASEL phrase allows him to distract not only from the real odds of hemoglobin random assembly but from the fact that each amino acid is represented by its three letters, not just one single letter as in the WEASEL phrase. Using the actual code would certainly make more sense, but it’s a reminder to the reader that the DNA code could not have been invented and assembled by a process as simplistic as evolution. Distraction is a typical modus operandi for all illusionists; evo-illusionists are no exception. Dawkins was cheating on top of cheating. Worse yet for Dawkins phony algorithm is the fact that proteins are chains, much like a pearl necklace. The spaces left in the chain of letters are just fine in a computer algorithm. The spaces were saved for the future correct placement of letters. In real life chain assemblages, spaces in a chain would mean the chain segments where amino acids that did attach would not be attached to other amino acids that were properly placed in the chain, and they would float off because they were independent segments. There would be nothing holding the segments in place as was the case in Dawkins algorithm. His experiment is a massive failure, and either poorly thought out, or put together to fool the masses. Dawkins was a true evo-illusionist at work, doing his stuff. So Dawkins is the perfect example of an evo-illusionist. Here he performed an illusion for his readers, and most of them certainly fall for it. I did on the first read. I had to go over it several times to unearth the illusion. If he used a task with the actual odds of 1:10190 like monkeys typing the last phrase in the Gettysburg Address, I kind of doubt a half hour and 64 generations would be sufficient. Of course, many questions arise out of Dawkins mind experiment. He so innocently proves what he is trying to disprove. A biochemical soup half of a billion years ago would have had no hemoglobin target for amino acids that may have been hanging or floating around. The amino acids could not have had foreknowledge of what the purpose and design of that target might be. In reality, Dawkins would need tens of thousands of chance assemblages, tens of thousands of odds of 1 in 10 190 as cells require tens of thousands of proteins. In mathematics the number 1:1050 is considered the demarcation line for a complete and infinite impossibility. Mathematicians won’t deal with any figures beyond 1050 , which makes this discussion and all of Dawkins effort moot; but here we are, arguing the absurd. Actually, it’s so much fun to puzzle about and think out, so I really don’t mind a bit. There are many other factors which make the odds of 1:10190 far worse for evolution if that’s possible. Note that Dawkins didn’t mention any of these in his book. I find it astounding that he didn’t. Did he forget? Oh, that’s right. This is just another part of the illusion. It would be like an illusionist doing the linking rings trick and showing his audience the opening in his ring. Here are only some of the other factors that Dawkins didn’t bring to the table. (1) Timing: Hemoglobin had to form in some organism that had already evolved the equipment that made the organism capable of utilizing it. The organism had to have already evolved red blood cells that carry hemoglobin. So did the organism that evolved one single hemoglobin molecule also already have blood cells that carried that one hemoglobin molecule to some cell somewhere? Did the organism also already have blood vessels? A heart of some kind to pump that one molecule to the location on the organism that needed oxygen? Because if it didn’t, the hemoglobin molecule would have been worthless. Timing was everything. Actually, a single hemoglobin molecule, assembled against the odds of 1 in 10190 would have been worthless anyway. Millions of molecules would have been needed to do any good for even a tiny organism. A single hemoglobin molecule would have been a miracle of Dumb Luck that would have been useless. (2) Location in the first organisms that evolved hemoglobin: Did that one incredibly valuable first hemoglobin molecule form inside of a red blood cell? If it came together, say, in the feces of the organism, or outside of any entity that could transport it to an organ that oxygenated it and could transport it to where cells needed it, the molecule would have just disappeared or wound up floating off in some body of water somewhere. The clock would have had to start all over on another hemoglobin molecule. Luckily there was lots of time, and according to Dawkins, anything can happen with lots of time! Right? (3) Genome modification: Did the organism that won the Lotto of the Universe and of Infinity by forming a hemoglobin molecule quickly modify its DNA so more molecules could form without the infinite Dumb Luck that was required to form one molecule? Or did it have to wait until another 1:10190 event occurred and a second molecule showed up? Then a third…..? Then……? Did supernatural selection act quickly enough to save that single molecule? It must have, because we all have lots of them. Or was the DNA itself in the first organism that formed hemoglobin trying to make some kind of protein that would carry oxygen? Did DNA have foreknowledge? (4) Number of molecules: Was one hemoglobin molecule enough to save some cells with its oxygen, and allow supernatural selection to select the super-lucky organism with that one molecule so that future organisms would be lucky also and evolve hemoglobin? Because Dawkins and other evo-illusionists talk as if that’s all that was needed to set off an incredible biological series of miracles. Dawkins talks of a single molecule of hemoglobin; his algorithm involves a single molecule. He sweeps under the rug that there are tens of thousands of proteins that need to be invented by evolution and that the odds of each one chance assembling is just as absurd as the odds for hemoglobin. The story is the same for each and every protein. Proteins average about 150 amino acids each. Dawkins needs trillions of trillions of monkeys typing for trillions and trillions of years. That wouldn’t even do the job of manufacturing one single hemoglobin molecule. (5) Migration to other species: How did that single first hemoglobin molecule spread from the first species that evolved it to other species? Since species cannot interbreed, it would seem that hemoglobin molecules would have had to form in many other species. In fact, all animal species independently had to form their own hemoglobin molecules, or find some really unusual and really ingenious technique to get the stuff from species that have it; a technique that we humans sure aren’t privy to. (6) Odds of a second molecule: Did Richard Dawkins take into consideration the odds of a second hemoglobin molecule forming after the first one formed? In figuring out odds, let’s say there are two unlikely events, each with a 1:10 chance of occurring. You can calculate the chance of both occurring by multiplying 1:10 times 1:10. The odds of both events occurring are then 1:100. Transposing that to the hemoglobin molecule, if the chance of one molecule forming is 1:10190, the chance of another hemoglobin molecule forming is 1:10380. The chance of a third molecule forming is 1:10570. It really just gets absurd with only three molecules. Remember, there are 1:1080 atoms in the entire universe. Even with Dawkins selective cheating, his odds would have been reduced to beyond impossible quickly. If his odds were 103 for evolving one molecule,evolving 100 molecules by chance assembly would have dropped to 10300 . I really wonder why Dawkins didn’t consider this himself. Or maybe he did. All of the poppycock about monkeys typing is a total waste of time. The requirement for a second molecule and the third kill the monkeys typing argument. (7) Chirality: Richard doesn’t take into consideration the fact that every amino acid that hooks up to other amino acids is a left-handed molecule Amino acids have right and left-handed mirror image versions, as I discussed in an earlier chapter. To form a molecule of hemoglobin, it would be as if you had a vat of black pearls and white pearls, and you were going to blindfold yourself and pick out and assemble a string of pearls that were all white. The odds selecting all pearls of one color, and stringing them on the necklace would be calculated by figuring 2 to the 146th. The resulting odds are 1 in 9 × 1043. Yes the odds would be much worse than the 1:1040 odds of Dawkins monkeys randomly typing his WEASEL phrase. (8) Bonds: Amino acids can connect together like a necklace using two different kinds of bonds. One is a peptide bond, the other is a non-peptide bond. To make proteins, amino acids must be connected by peptide bonds. The odds of getting all peptide bonds is 2145 or 4.46 x 1043. This whole segment is complete overkill. Every single probability in this discussion is so far beyond absurd. Why is this discussion even necessary? Isn’t an intelligent person like Richard Dawkins capable of figuring it out for himself? (9) Geography: If a second molecule formed on its own, did it form in the same location as the first? What if it formed by the North Pole, whilst the first molecule formed near the equator! Actually if a molecule of hemoglobin formed only one foot away from another, it would be similar to two people being 5800 miles apart! Would the two molecules that formed out of DL find each other so they could be “found by” and carry oxygen the for organism that originated them? (10) Assumption that amino acids would join: For the hemoglobin number to even have validity, it must be assumed that free amino acids were frantically “swimming around” trying to join together to make something; hopefully hemoglobin. Why wouldn’t they just have been floating around in their environment? Why would they be frantically joining together at all? 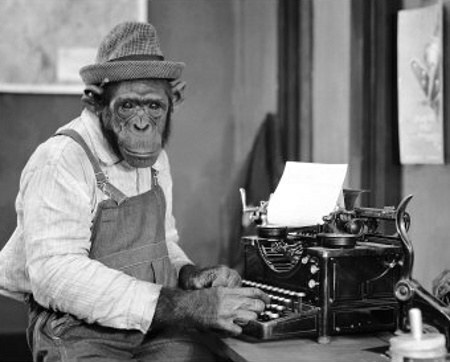 In Dawkins mind experiment, the monkeys have a task: that of typing. In reality the notion of amino acids coming together and forming proteins would mimic the scene of putting one thousand monkeys in a room with one thousand typewriters and hoping they will all sit down and type. Reality is it would be complete monkey chaos. In a world without intelligence, organization, or motivation, it’s highly doubtful that amino acids would be looking to do anything but be amino acids; which makes the hemoglobin number 10infinity. (11) Invention: Dawkins completely ignores his biggest problem of all: that of the invention of hemoglobin. Just think of how incredible this invention is: a protein that carries oxygen to oxygen starved cells. On the early Earth of 500 million or so years ago, was hemoglobin new? Useful? Not obvious? Of course it was. New, useful, and not obvious are the criteria for determining whether any entity is patentable by the United States Patent office. Under these criteria, hemoglobin would have been accepted as an invention without the slightest protest. IID would have been listed as the inventor. Dawkins certainly proved that random mutations and natural selection had absolutely zero chance of being the inventor or the designer. The notion that an entity, the early Earth, with absolutely zero IQ, could come up with the idea of hemoglobin is just so absurd. Actually, that’s the case for the first version of each and every protein in each and every cell; and the first version of each and every bio-logical system. Each and every eye, each and every pump (heart), each and every brain, each and every ball and socket joint, each and every auditory system, muscle, filter (kidneys, liver), bird nest………..The first version of each and every utilitarian entity in living nature is an invention, pure and simple. Invention is the real coup d’etat for evolution. (12) Not just a chain: Hemoglobin isn’t just like a straight pearl necklace. It has a very complex structure that wipes out any notion Dawkins might have for the chance assembly of a hemoglobin molecule. The odds of self assembly are far less than the 1:10190 in Asimov’s number. To give you a vague idea of how complex hemoglobin really is, here is a small segment of a description of its design. Feel free to glance at this paragraph, or skip it entirely. All you need to know is that hemoglobin isn’t just a chain as Dawkins touts and NEEDS for his monkeys algorithm. (13) There are about 400 naturally occurring amino acids: For the evolution of hemoglobin to have taken place, there needed to be some kind of reservoir that contained only AND all of the amino acids that occur in hemoglobin so that hemoglobin could be randomly assembled. This reservoir had to be genetically passed on from generation to generation as the hemoglobin molecule was building itself. Just imagine the chance assemblage of one single hemoglobin molecule if fifty or one hundred amino acids were in the reservoir instead of the twenty used by mankind. Or what if only five of the needed amino acids were present in the reservoir? Or what if many other biochemicals were present in the reservoir that wasn’t needed in the formation of hemoglobin molecules. This discussion is so ridiculous. Why is it even necessary? The odds of the chance formation of proteins alone kill the notion that evolution is responsible for all of living nature. With only this argument alone, evolution should curl its tail under its legs and go off and hide. But it won’t, so absurd discussions like this one will continue on until it does. Since all evolutionaut indoctrinates think there are peer-reviewed papers on the internet that explain the above problems for evolution in my analysis, I have decided to post one of the best of those papers. 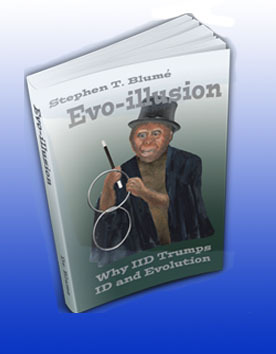 If you’re an evolutionaut, your assignment is to use my non-peer reviewed paper above to analyze the evo-illusionist paper below. If you can give it an honest and objective comparison, you will see that my paper destroys the one below, and you no longer could be an evolutionaut. If you are so indoctrinated that you cannot see why my paper completely trumps the paper below, you are beyond help. If that is the case, feel free to let me know where you think I went wrong. By the way, the writer’s comparison of hemoglobin with a snowflake is another evo-illusion piece of trickery performed to fool the gullible. Snowflakes have no physiological utility. The only rational comparison would be by the use of another biological entity that has physiological or biochemical utility, such as the Krebs cycle or clotting proteins and mechanisms. Unfortunately, these kill evolution in the same way hemoglobin does. So evo-illusionists are stuck with inanimate nonutilitarian entities like snowflakes in trying to fool you. If you are an evolutionaut, they will most likely be successful. Report of National Center for Science Education, vol. 20, no.4, 2001. Some of the most impressive-sounding criticisms of the conventional theory of biological evolution involve probability. Such arguments have been raised, not just by religious fundamentalists, but by numerous others who are reluctant to accept the prevailing scientific theory of the history of life on earth. On the basis of such arguments, some conclude that the currently accepted theories of the naturalistic origin of life and evolution are seriously flawed. Others argue further that these arguments demonstrate that life on earth could only be the result of miraculous acts by a divine creator. As a scientist of religious faith with training in probability theory, I have studied a number of these arguments in some detail. It is well known among mathematicians that probability arguments are treacherous — even experts can fool themselves. In the hands of those who are not expert both in probability and evolution, and especially in the hands of someone with an agenda to advance, the results are, in my experience, almost universally invalid. A few examples will illustrate how probability should and should not be used. Anti-evolutionists have for many years advanced probability arguments in their efforts to “prove” the impossibility of scientific models in cosmology, astronomy, physics, and the origin of life. More recently, Michael Behe’s concept of “irreducible complexity” in biochemical systems has fueled various arguments about the impossibility of a natural emergence of complex biological systems, such as blot clotting cascades, the bacterial flagellum, and hemoglobin. The basic approach used in these studies is to calculate the probability that some phenomenon could occur by a natural means, and then to claim that the extremely remote probabilities render the existing scientific theory invalid. Consider the alpha chain of human hemoglobin — a key component of blood which serves as a transfer agent for oxygen. The alpha hemoglobin molecule is a protein chain based on a sequence of 141 amino acids, and the hemoglobin of virtually every human has the same sequence. There are 20 different amino acids common in living systems. Thus the number of different chains [141 amino acids long] is 20^141, or roughly 10^183. If 5 billion years ago, as many as 10^40 amino-acid–molecule generators, each producing a different randomly chosen 141–amino-acid sequence one billion times per second, began generating sequences, then at the present point in time only about 10^66 sequences would have been generated. Thus the probability that human alpha hemoglobin would have been produced is about 10^66÷ 10^183 = 10^–117, a fantastically small number. Thus no conventional theory of molecular evolution can account for the origin of human alpha hemoglobin. This is an intriguing line of reasoning, but it has serious flaws. One flaw, common to many arguments of this sort, is that it is an after-the-fact assessment of probability, which is unreliable without a very careful consideration of all possible alternate contingencies. This difficulty can be illustrated by examining discrepancy counts between the alpha hemoglobin chains of humans and other animal species (see examples in Hoyle and Wickramasinghe 1981: 17). As one might expect from evolutionary models, the differences in the molecular structures of these hemoglobin chains are entirely consistent with the phylogenetic “family tree”. In particular, the human alpha chain is identical with that of chimpanzees and differs by only one amino acid from gorillas. In more distant vertebrate relatives, the alpha hemoglobin chain differs by 25 amino acids between humans and rabbits and by about 100 between humans and various fish species. Thus there are countless variants of the alpha hemoglobin chain that perform the essential function of oxygen transport since these variants successfully serve that function in various other animal species. Indeed, most of the 141 amino acids can be changed without altering this basic oxygen transport function. The process of evolution long ago settled on one particular sequence for humans, but many others might have been selected without loss of essential function. Revising the probability calculations used by Hoyle and Wickramasinghe from this point of view — that only about 25 particular locations must be correct to enable the oxygen transport function — the probability that a chain 141 amino acids long would be a usable hemoglobin molecule can be calculated as 1 in 20^25, or roughly 1 in 10^33. This is still a very small probability, but it is vastly greater than 1 in 10^183 —the probability calculated by Hoyle and Wickramasinghe. Given odds of 1 in 10^33, the hypothetical random molecular generators mentioned above could discover a usable hemoglobin molecule trillions of times per second (although no one suggests this is the way that hemoglobin actually arose). Furthermore, the probability calculations employed by antievolutionists assume that all 10^183 amino acid chains of length 141 are equally likely to be produced. Instead, we know that some classes of molecules are much more likely than others to arise naturally. In summary, modern biology has only a partial idea of the process through which human hemoglobin originated and how it has changed through the years. Thus it is highly premature to pretend that anyone understands the process well enough to compute accurate probabilities. Such calculations are inconclusive. Another way to better understand the difficulties with anti-evolution probability arguments is to consider snowflakes. Each individual flake is much less than a milligram in mass, yet snowflakes exhibit remarkably beautiful and symmetrical patterns. Bentley and Humphrey’s book Snow Crystals (1962) includes over 2000 high-resolution black-and-white photos of real snowflakes. Many of these images are utterly fantastic, with wildly improbable yet astonishingly regular patterns. Each one occurred naturally and was collected and photographed by Bentley and his assistants. What are the chances that one of these structures can form “at random”? To simplify the problem, let us consider only the phenomenon of 6-way symmetry, a characteristic of almost all snowflakes. Imagine laying out the snowflake on a small grid with 100 subdivisions on a side (so that the grid contains 10 000 cells) divided into 6 equal sectors (with about 1666 cells each). We can calculate the probability that the pattern in one sector will be identical with the five patterns in other sectors as follows: the probability that 2 sectors have identical patterns is approximately 2^-1666, or roughly 10^-500; this value raised to the 5th power is 10^-2500. This probability is even more extreme that those I have seen in anti-evolution literature. Even if we allow that snowflakes in nature are not perfectly symmetrical (so that perhaps some stretching might be required for the sectors to precisely overlap), a snowflake is an exceedingly improbable structure, by any reckoning. In particular, it is extremely unlikely that a random roll-of the-dice assemblage of water molecules would assemble a single snowflake with a specific designated structure. And yet this phenomenon is repeated trillions of times in a typical snowstorm. It is important to note that, in contrast to evolution, this process does not require billions of years to occur — most snowstorms last only a few minutes to hours at most. Further, there is no coding mechanism to specify the outcome, as there is in the intricate machinery of DNA-based genetics. Snowflakes just happen — a homogeneous, undifferentiated mass of water molecules cools and becomes a sea of beautiful snowflakes with highly specific and differentiated structures. One could almost convince oneself that snowflakes constitute a demonstration of supernatural power. What is wrong with the above line of reasoning? It is the fundamental assumption that a snowflake forms all at once as a random roll-of-the-dice conglomeration of water molecules. It does not. It is the product of a long series of aggregations, each acting under known physical laws of atomic interactions, forming much as a crystal of salt forms. A snowflake’s 6-way symmetry is in fact a reflection of an underlying 6-way symmetry inherent in the atomic structure of frozen water. This same general criticism applies to many probability-based arguments against evolution. Such arguments usually assume an all-at-once, completely random assemblage with no pre-existing structure. But this is most assuredly not what has happened — the organism or amino-acid chain we see today is the end product of countless generations over many millions of years, taking a small step each time. At each step, the existing structure is modified— added to, subtracted from, and so on. It is not “back to the drawing board” each time, but rather adjusting, fine-tuning, retooling existing plans. The evolutionary process is astonishing — one that we do not yet fully understand — but there is clearly nothing there that represents a violation of any of the fundamental the laws of probability. Probability calculations should be a tool to help us calibrate the diversity of life and the extent to which various lineages may have diverged from common ancestors. Instead, they often are used as a tool to manipulate scientifically unsophisticated audiences. Further, probability-based arguments for a Creator are, as far as I can tell, merely another instance of the “God of the gaps” approach to theology — the shopworn philosophy that God can be found in the gaps of what currently remains unexplained in science. Those who have adopted this approach over the centuries have invariably been disappointed as scientific knowledge fills more and more of the remaining “gaps”. Nowadays the catchphrase for this approach is “Intelligent Design Theory” (IDT). The idea is that such remote improbabilities can only be overcome by a designer. Many in the IDT movement see that designer as the God of the Bible, and design in nature as proof of the existence and direct involvement of God in minute details of everyday life. But it is wise to keep in mind the common experience of many religious believers, who have found that seeking “proofs” for the existence of God (scientific or otherwise) is an ineffective and often counter-productive route to faith. Jesus of Nazareth frequently commented on the dangers of seeking “signs” (Matthew 12:39, 16:4; Mark 8:12; Luke 11:29). Sounds like good advice to me. Bentley WA, Humphreys WJ. Snow Crystals. NY: Dover Publications, 1962. Foster D. The Philosophical Scientists New York: Barnes & Noble Books, 1993..
Hoyle F, Wickramasinghe C. Evolution from Space. London: JM. Dent and Sons, 1981. Does [h]emoglobin [a]lone [d]estroy [the theory of] [e]volution? Why thank you. I put a lot of thought into it. Then realized that there are plenty of articles and papers on the evolution of haemoglobin on the Internet if anyone was genuinely interested. And I like how you endorsed your own comment like that “Yup”, real classy. Glad you liked the “yup”. I posted one of the best evo-illusionist articles at the bottom of the page. (44 in red and purple) My bet is the paper has you fooled just like all other evolutionauts. You seem so intelligent, give it a try. See if it trumps my article. My bet: you won’t. You would fail. If you have another BETTER article, let me know! But before you do, just to help you out, my article trumps any pro-evolution article that could be written by any human on the odds of hemoglobin evo-formation . Nice feeling. For me, that is. Well as long as you impress yourself, that’s the main thing eh? Why did I think you would bypass my challenge? You are predictable and typical. If I know I’m right it’s not hubris. It’s just pure reality. No person on Earth can explain the evolution of hemoglobin, so my confidence comes easy. Excellent article proving hemoglobin could NOT have evolved! Really enjoyed your facts and logic. We think alike but that is a curse too. Illogical people drive us nuts. You can give them many chances to make sense, and yet they just keep coming up with insults and more illogical comments that never counters anything against them. Just look at the comments “against” you; no substance whatsoever. But it’s fun too. It’s like a huge tiger having fun with a little mouse, but with this issue, the mouse actually thinks it’s the huge tiger. I often have have fun with people trying to explain how we got human sexual reproduction. It’s clear that’s how we got here, so how did it evolve? Something had to grow a bump and something a hole, and keep reproducing somehow until the bump and hole functioned as the means of reproduction until we have what we see today as an extremely complex way to reproduce. All they do is give theories and other means of reproduction that never explain the real issue I asked. The clear reason is because it makes no sense. A few, after their shallow attempts to have tried to explain it, admit they don’t have any logical answer, but that does not stop them believing it still happened somehow that we just don’t know yet. So to me, I find it is useless to keep on debating a person who has no problem being illogical. Illogical thoughts do NOT bother them, but for a logical person, illogical thoughts can not be accepted. That being said, I am amazed how illogical people spew out their garbage and sound so confident and assured they are on the right path. They have perfected their selective blinders. Again, THANK YOU for your FANTASTIC article. Bravo!!! Sounds like we are on the same page. I have a thread dedicated to me on rationalskepticims.org (Why stevebee Is Wrong) that goes 290 pages. It’s solid demeaning and ridicule. But it sure is fun. I love to pull their chains and watch them in action. They say the same things over and over endlessly. They think in groups, never individually. Evolution is nothing more than a form of mental illness, but the sick have no idea that they are. Thanks for the comment. Yes, I’ll check out that site and thread. Proverbs 18:2 says fools have no delight in understanding but wants to express what is important in their minds. I’m all for hearing about a person’s thoughts and expressing mine too. What a boring life it would be without that. I certainly don’t know everything and I recognize my strengths and my weaknesses. It’s fair to anyone that we respect their strengths and learn from them. Where I lose respect for people is when they don’t admit a weakness that is clear that they have. Many years ago I learned it is much easier to admit I am wrong rather than making a fool out of myself trying to continue defending my wrongs. Also learned, it’s a rather lonely life to actually think on your own. The world is “setup” for major groups and you either accept them totally or you’re an outcast. A person has to be committed to thinking on their own because it certainly isn’t any joy ride. So be it. Yes, as evolution is currently accepted, hemoglobin does indeed “destroy” it. But this article didn’t go far enough. There are ~10,000 proteins in the human body and they all have to work simultaneously, which makes the power ~20^10190: a way, way larger number than the atoms in the universe. Actually, Dawkins pulls a fast one in his book TBW. 10^190 is for the chance formation of only one strand of hemoglobin, which actually has four strands. The true hemo-number is about 10^750. Either number is good enough to kill evolution. Interestingly, there are about 90,000 proteins. The Human Genome Project counted only about 20,000 genes, not nearly enough to code for the proteins. The plot thickens. In my book I do several pages on protein synthesis, which is like a computerized manufacturing plant. As you say, ribosomes are like CNC/ticker tape machines combined. Gad, the whole thing is so astounding. I wish I would have appreciated it as much when I took biochem/biology in school. I studied if for grades then. Now for complete and utter fascination. Go to YouTube and type motor proteins in the search box if you want to be dazzled. I’m not crazy about labels, but I would say I’m a non-religious non atheist. In the agnostic realm. But there needs to be some sort of overwhelming intelligence to put all of this amazing stuff together. I wish I knew where. What a great Puzzle. Evo-illusion! I haven’t heard that before, it is a brilliant title. Thanks for the great comments Nina! % 20 amino acids, can be evolved in around 10,000 generations. % probability by “singe step” change being effectively 1/infinity. % Hopefully this puts the silly discussion on this web site to bed. Somehow your comment came through very garbled. Cumulative selection is a figment of Dawkins imagination. It requires a goal (hemoglobin) so that the “correct” amino acid placements are saved. The goal must be known in advance of the evolution and the saving. You might want to actually read the article before commenting. In fact, itt is NOT necessary to know the end goal for the cumulative selection algorithm to work, just to have a situation wherein fitness can be evaluated, and one can say post-hoc that one “version” or something performs better than some other version. In nature, a better version might be interpreted as an organism being more successful at surviving long enough to breed. I could upload other code (like the above) that uses cumulative selection to obtain steadily improving versions of something (like the travelling salesman problem, knapsack problem, etc) where the ideal solution is NOT known beforehand, but where fitness (how well the chromosome performed) can be measured, enabling individual solutions to compared to determine which are better (i.e., which will survive and be bred from, and which will perish). Cumulative selection means the placement of an amino acid in the protein chain is correct toward the goal of making a functional protein. Your discussion is gibberish, and you have no idea. But you need gibberish to believe and support evolution. Your other problem is that proteins are chains and there are no templates which hold the good choices while others are being “tested” and either accepted or removed. What is it that does the “accepting”? The deciding? When there are only a few amino acids how does cumulative selection know where the assembly is going? How are all left-handed amino acids selected? You have so much fantasy to believe. Why do you fall so easily? That is really the big question here. But believe you must and will. BTW, the algorithm had to be programmed with an end result, or it would have gone on endlessly. There would have been no finish line or time. This is a great article! I added think link to my library for future reference. I noticed Bailey briefly mentioned Richard Carrier, another mathematically-challenged legend-in-his-own-mind (not to mention a Richard Dawkins wannabe). Bailey must have been hard-up for references. “Of all the hemoglobin number of combinations, only one combination has the precise properties of the hemoglobin molecule found In the human being. To test that number of combinations one after the other to find the one would, as you probably rightly suspect, take time. But given enough time, enough scientists, enough generations of scientists, surely trial and error would come through with the answer, inevitably, at long, long last. But exactly how much space and time would be required? “… the Earth has existed in solid state for something like three and a third billion years 3-3 x 10^9. Suppose that in all that time, Earth has been just as rich in hemoglobins as it is now. If that were true, the total number of hemoglobin molecules ever to have existed on Earth would be 10^50. This is still nowhere near the hemoglobin number. That in no wise considers other factors that must already be in place to preserve and utilize the hemoglobin. Perhaps time is not really the hero, after all.